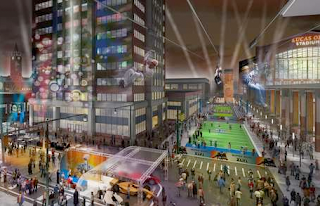 Indianapolis is going to open a whole theme park for Super Bowl XLVI called the Super Bowl Village. The free and family-friendly Super Bowl Village will transform the heart of downtown Indianapolis into a ten-day, three-block interactive festival for the Super Bowl. The Super Bowl Village will host tons of musical acts and events. The Super Bowl Village will also host a cool action ride. The IndyStar says the Super Bowl Zipline could be the biggest Super Bowl 2012 attraction. The Super Bowl Zipline will open on January 27 and stay open until February 5, Super Bowl Sunday. The course of the Zipline runs along Capitol Avenue towards the Lucas Oil Stadium and is 800 feet long. Tickets run for $10 and can be purchased already in advance here.